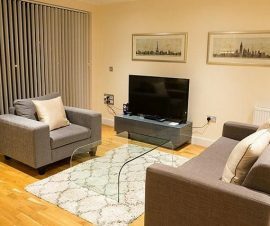 These apartments in North West London, are located close to the trendy St Johns Wood and only a few minutes walking to Swiss Cottage and Finchley Road stations. The property offers a collection of studios, one and two Bedroom apartments featuring cotemporary décor. 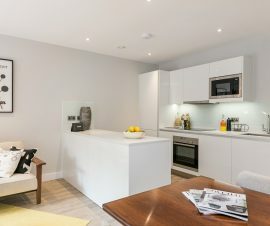 These generously spaced and modern apartments in London are thoughtfully designed and come with a fully fitted kitchen, all bathrooms with rain showers over bath, fitted floor to ceiling wardrobes and King Size Beds. 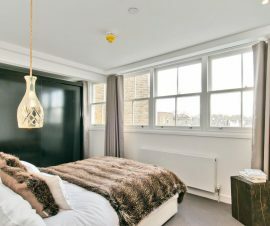 The huge bay windows allow plenty of day light in to the apartments, yet the blackout curtains will ensure you get a good night’s sleep by shutting out any external light. Our interior designer has struck a balance between modern design and a warm ambience to bring a sense of familiarity to the apartments and communal space evoking a true sense of a home away from home.